Illustrator Federico Babina has immortalised the faces of 33 prolific architects, including Zaha Hadid, Mies van der Rohe and Álvaro Siza, by creating portraits made up of elements from each of their buildings. 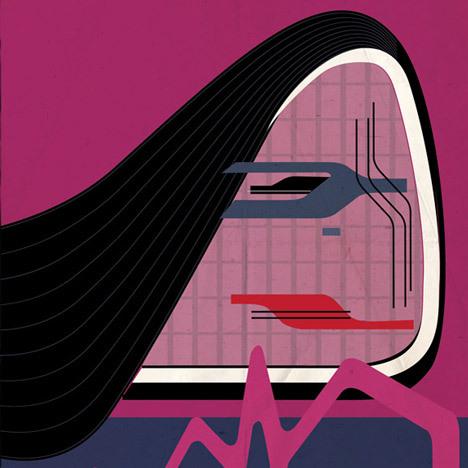 For the Archiportraits series, Federico Babina used architectural elements such as windows, columns, staircases and even floor plans to generate features including eyes, noses, frown lines and facial hair for a series of twentieth and twenty-first century architects. Subjects also include Jean Nouvel, Daniel Libeskind and Bjarke Ingels. The intention in each case was to convey personalities and moods, as well as a likeness. "A portrait is like the mirror of the soul," said Babina. "The shapes and geometries that are designed by the architect become features for drawing his [or her] face." The Italian graphic designer came up with the idea after picking out the lenticular eye shape from Oscar Niemeyer's Museu do Olho. "I started searching shapes in architecture to build a portrait," he told Dezeen. An upside-down illustration of the Sagrada Família becomes the neck and chin of Spanish architect Antoni Gaudí, while Norman Foster's nose is provided by the Gherkin. Frank Gehry's Dancing House gives the architect his right ear and Rem Koolhaas features a nose shaped like the CCTV Headquarters. Alongside Hadid, there are only two other women in the collection; Eileen Gray is drawn with a neck made from her Black Block Screen and Kazuyo Sejima is shown wearing an outfit resembling the Zollverein School of Management and Design. "I do not want to be unflattering, I just like playing with architects and architecture," said Babina. "Every little detail is a key component of the whole mosaic," he added. "I tried to develop an expressive and allusive abstraction in which I combined planar structures with three-dimensional shapes to achieve a kind of metaphysical expression." Other architects in the series include Frank Lloyd Wright, Gerrit Rietveld, Le Corbusier, Toyo Ito and Richard Rogers.